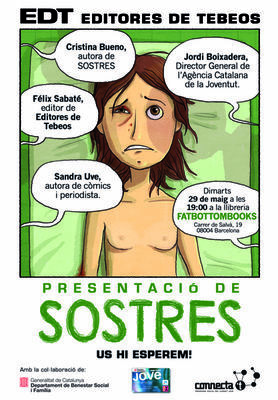 Cristina Bueno is the winner of the III Beca Carnet Jove Connecta't al Còmic 2011 and on Tuesday she will be presenting and signing her comic published by the editors of comics. Sostres ("Roofs") is an autobiographical story about a motorcycle accident that changed the life of the author. Explains the empty hours in the hospital, the loneliness, the sadness, the reflection, the relationship with doctors and family.